As Lord Orochi demands that Komurasaki beg for her life, we learn that his devil fruit is called the Hebi Hebi no Mi, Model: Yamata no Orochi. She refuses to beg, resulting in Orochi becoming further enraged and rampaging. His eight head beg to attack people almost at random. Eventually, he captures Komurasaki in one of his mouths. Robin tries to flee with Toko, as the still laughing girl asks her to ave Komurasaki. Meanwhile, the ninja’s continue to pursue her. 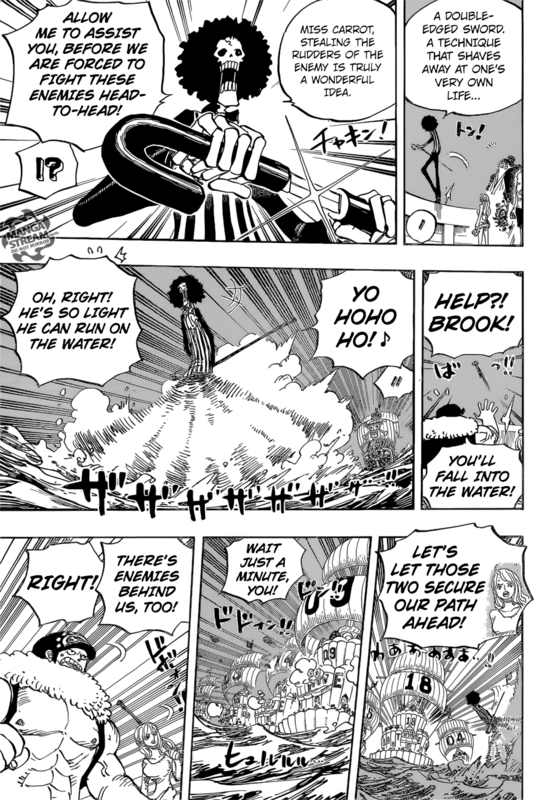 Brook rescues her, by using his soul to appear as a ghost. It’s at this point you realize that most of the citizen or certainly the ninja are ignorant of the devil fruit abilities. It was made clear at the beginning of the Wano arc, that Wano Country is isolated from the rest of the world and have no affiliation with World Government. The consequence of this is a lack of knowledge of the rest of the world. When Brook uses his soul ability the ninja’s assume that he’s a mythological ghost called Gashadokuro. When Robin uses her Gigantesco Mano ability the ninja wonders if she’s a ghost as well. In the ceiling, Shinobu tells Nami that they need to back up Robin and Brook. They are confronted by a ninja named Hanzo. He seems to remember her as a more beautiful, kunoichi dubbed the “man killer.” He thinks he made a mistake as she has gained a lot of weight. Insulted, she uses Ninja Art: Ball Crusher, then Ninja Art: Paralysis. She then knocks the ceiling down knocking out some of Lord Orochi’s heads. Meanwhile, during all the chaos, Kyoshiro “kills” Komurasaki. I don’t believe that she dead. It seems more likely that her “death” was staged. Lord Orochi is upset that Kyoshiro would kill her. He claims that it “was a samurai’s mercy.” He then notices the hidden message from the Kozuki Family. Orochi takes his attention from Komurasaki to Toko. However, Nami uses Zeus to unleash a devastating thunder attack. We don’t see the result of this, as we head to the beach to find Tsuru feeding Big Mom. Still without her memory, Big Mom is grateful for their kindness. Chopper is concerned that Big Mom will regain her memory at any point. He tells her that there’s a lot of shiruko in Udon. Chopper is clever here. Sending Big Mom to go to Udon prison could at least be the distraction needed to free Luffy and if she regains her memory all the better. If Udon is so hard to escape from someone with Big Mom’s power could can help. How much manipulation Chopper needs to engage with to get Big Mom to help remains to be seen, but she still seems to be obsessed with food. 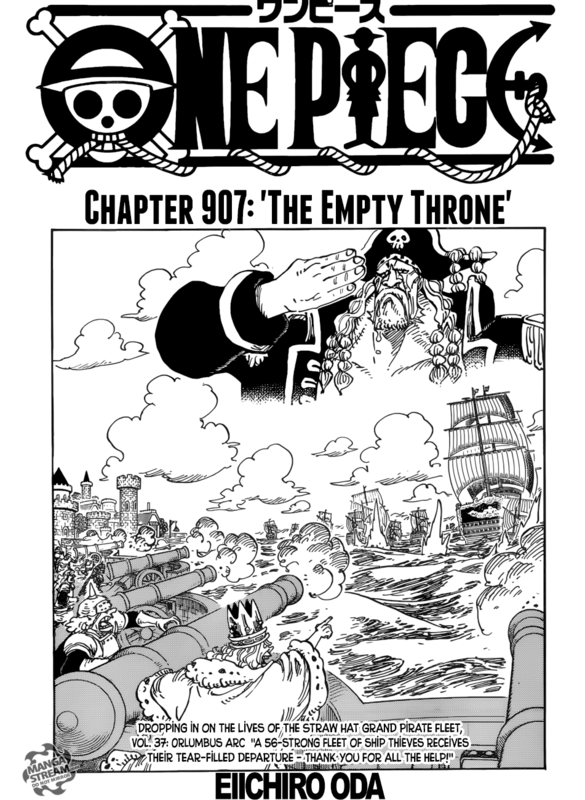 The chapter ends with us being told that the ” decisive battle against the Beasts Pirates will occur in nine days.” Now what does this mean in terms of time. Is it nine days in real time or in the One Piece universe? It seems like it makes more since that it’s in the One Piece universe. Regardless, I’m excited to see this battle. I’m hoping it could rival the war with the Whitebeard Pirates. Zoro arrives to Ebisu Town, where he’s greeted pleasantly by the starving residents. Each of them mentions how hungry and malnourished they are while smiling. Yasu tells him that “since humans have been blessed with the gift of laughter, it would be wasteful not to use it.” They citizens mention that Ushimitsu Kozo arrived last night. Kozo is a thief that steals from the rich to give to the poor. His motives are unclear. In a surprising turn, Big Mom and her pirates arrive at Onigashima searching for Luffy. Having tied carp to her ship, they’re being pull up the waterfall. Kiado, demands that his subordinates stop them. 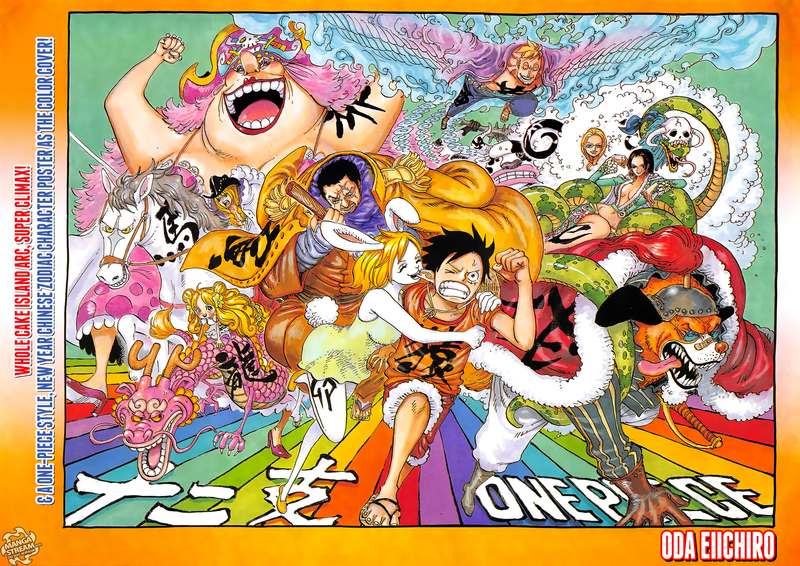 Fearing an “All out war,” Kiado grows more fearful of Big Mom causing trouble. King arrive in the form of pteranodon using his Ryu Ryu no Mi, Model: Pteranodon. He causes the ship of Big Mom to flip over, sending her into the sea. Obviously, Big Mom won’t meet her end her. However, being a devil fruit user she can’t swim, I wonder if her children can save her. In the Flower Capital, Law, Sanji, Usopp and Franky are fleeing the Beast Pirates as they try to find Sanji. Law discourages Franky from fighting sighting it’s risks. However, when a woman is under attack from Page One in his spinosaurus form. He demands that they call out to Sangoro and they do so. The civilians flee before Hawkins and Drake arrive, however, Sanji prepares to use his Raid Suit as it protects him from injury and will conceal his identity. Oda has found a convenient way to get Sanji to use the suit that he refused to use before. 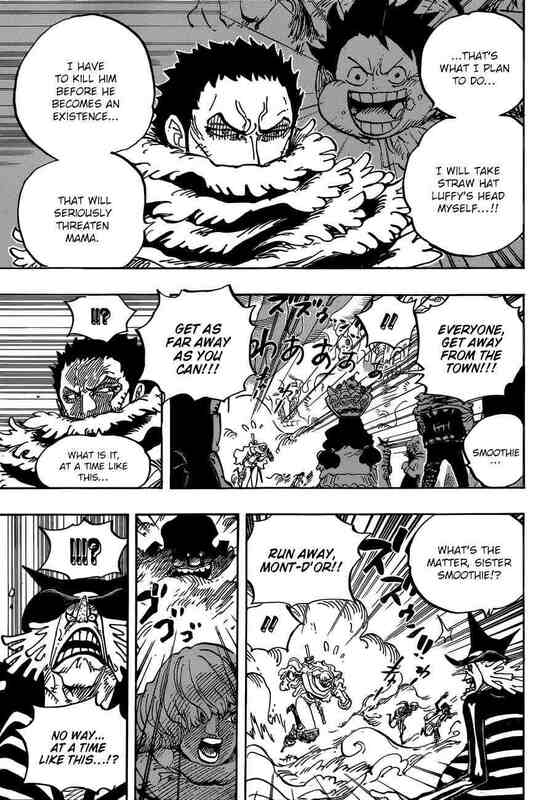 It seems like Kiado’s subordinates are going to have dinosaur devil fruit abilities. Considering the vast variety of dinosaur species Kiado may have many Ancient Zoan-type devil fruit users. So far we have only seen three, X Drake, Allosaurus, Page One, Spinosaurus and King, Pteranodon. They’re all aligned with the Beast Pirates. This chapter is the rare one that didn’t feature Luffy at all. This arc does feel that it’s rushed , there’s so many characters both new and old that it can be difficult to focus. Regardless, another great chapter. 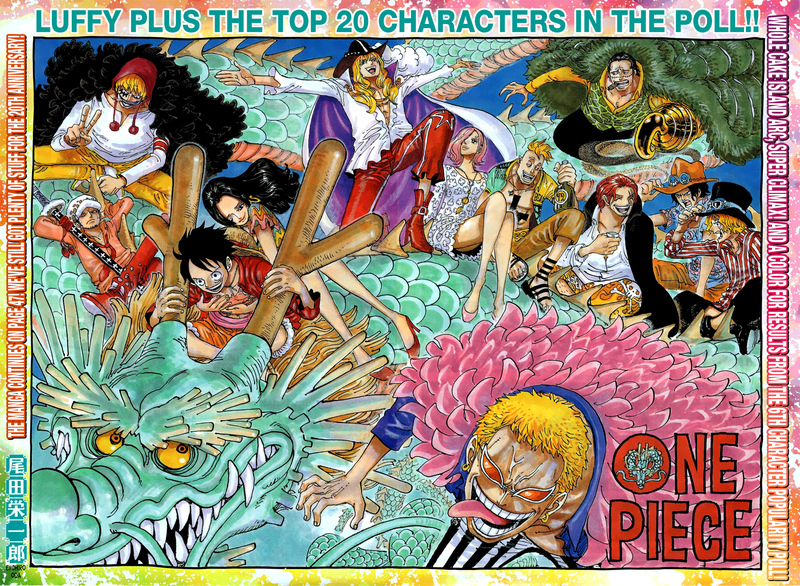 Oda continues to up the stakes and add to the lore of this magnificent series. It was already stated that Kiado and Big Mom had some connection, in this chapter they both want the head of Luffy. Kiado threatens to “kill” her if she interferes. Big Mom refers to a “debt,” that he owes her from a long time ago. 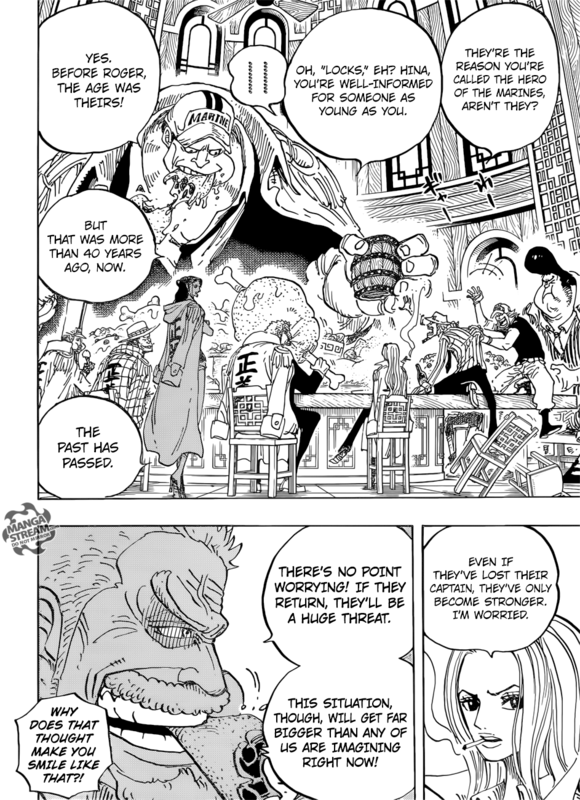 Garp later confirms that both Big Mom and Kiado were on the same pirate crew at some point. It’s not made clear why but Garp became “the Hero of the Navy,” because of his dealing with the Yonko. I assume he either defeated or killed their former leader. Hina references a “Rocks,” which is referring to a era before Gol Rogers. We are shown the “Empty Throne” an aide tells Sterry that he cannot sit on it because “its vacancy symbolizes that the world is not ruled by a single figure, sending a message of peace by making all royals equal before it.” Even the Five Elders and the World Nobles are forbidden to sit on the throne. Something tells me that Sterry is stupid enough to violate this long held rule. Considering, stupid royals, Charlos proves that I was right in my last review. He has his giant slave attempt to kidnap Shirahoshi in full view of everyone. Rebecca and Vivi unsurprisingly are horrified and Sai and Leo only to defeated by Rob Lucci and CP-0. Lucci says that whatever a “god” wants they get. Neptune plans on attacking CP-0 and Charlos, he states that he cannot bring his his people to the surface. Surprisingly, someone attacks Charlos with a club apologizing for Charlos actions. He reveals himself to be a World Noble named Mjosgard from the Donquixote Family. He’s says he owe’s Ryugu Kingdom a great debt. Apparently, Otohime “showed him the error of his ways and made him into a human.” Up until now we were lead to believe that all World Nobles were terrible, elites that abuse their power. Mjosgard seems to be different, even though he still benefits from slave labor. Finally, Shanks appears at Mary Geoise to speak with the Five Elders. 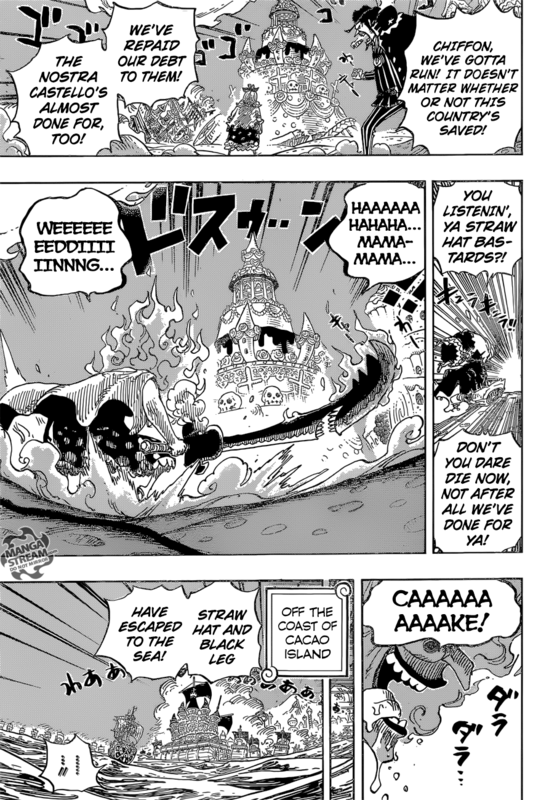 First if the cake is poisoned and Big Mom dies, the Big Mom pirates will end. 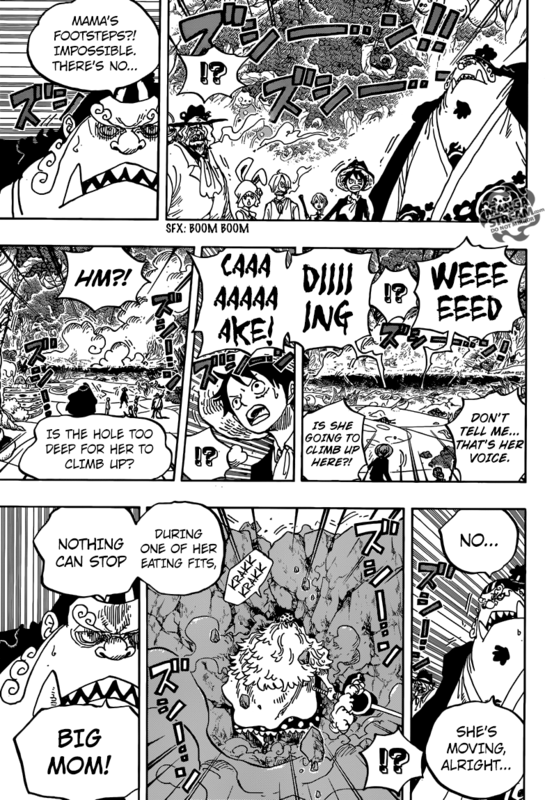 If Big Mom manages to survive being poisoned, she will continue to rampage and destroy Totto Land. Finally, if the cake is delicious then the only problem they will have is the damage already sustained. Of course we (the reader) already know that the cake will be delicious so we could assume the outcome. The citizens of Nuts Island, Poripori Island, Cutlery Island and Ice Island all decry their current predicament, assuming the worsts. Luffy comically wave goodbye to Judge, as he questions why “Judge would list all of Sanji’s positive traits,” resulting in Jinbe laughter. Big Mom’s fleet appears in front of them, as they become surrounded. Jinbe begin’s to lose hope, but Wadatsumi rises up from underneath the sea. Wadatsumi is a member of Hody Jone’s crew, Jinbe dives into the sea to reunite with the Sun Pirates, as they plan to serve their former Captain until he leaves Totto land. At this point it seems that this arc is set to end. 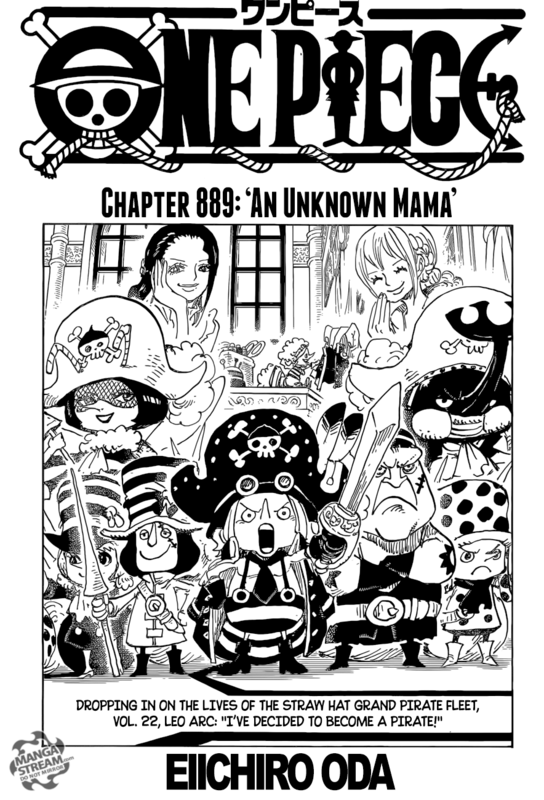 The conflict between the Germa 66 and the Big Mom pirates would probably end off screen. At this point I find it hard to believe that they won’t escape. The question I do have is what happens to Pudding, she’s so untrustworthy but she did aid the Strawhat’s. Will she be able to convince her siblings that she wasn’t helping the Strawhat’s? I’ve been predicting that after Big Mom taste that cake she will be grateful to Sanji, but now I’m starting to think that she would want him to be capture so she could have more of that cake. We’ll see next week. 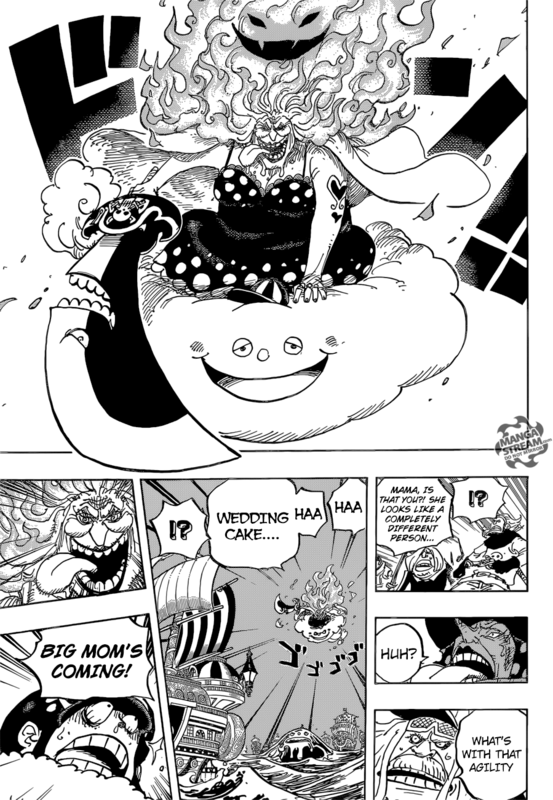 Bavarois and Perospero remark how Big Mom never “was never this hungry.” The newly slimmed Big Mom begins her search for the wedding cake, she rips off the upper deck of the Sunny. Jinbe tells her that she has the wrong place, Big Mom, however doesn’t believe her son would lie to her. She says otherwise “she’ll have to kill her eldest son.” Perospero is shocked that she remembers what he told her. Can Jinbe handle Big Mom, short answer, kinda. Big Mom swings her now inflamed sword Napoleon at him, but Jinbe blocks with Kairagi, shielding himself with Busoshoku Haki-imbued arms. He manages to temporarily stop he strike, but ends up being knocked into the sea. Big Mom continues her rampage, Nami attempts to stop her. Big Mom’s flame hair lights the sails of sunny on fire, Chopper blocks Big Mom’s attack with Guard Point. 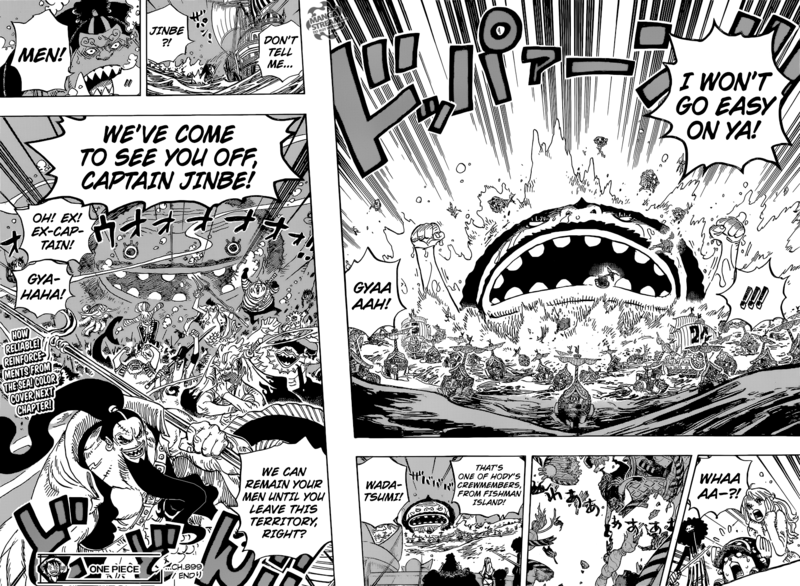 Jinbe uses Shoulder Throw: Sea Current to put out the fire on the sails and fire in Big Mom’s hair. 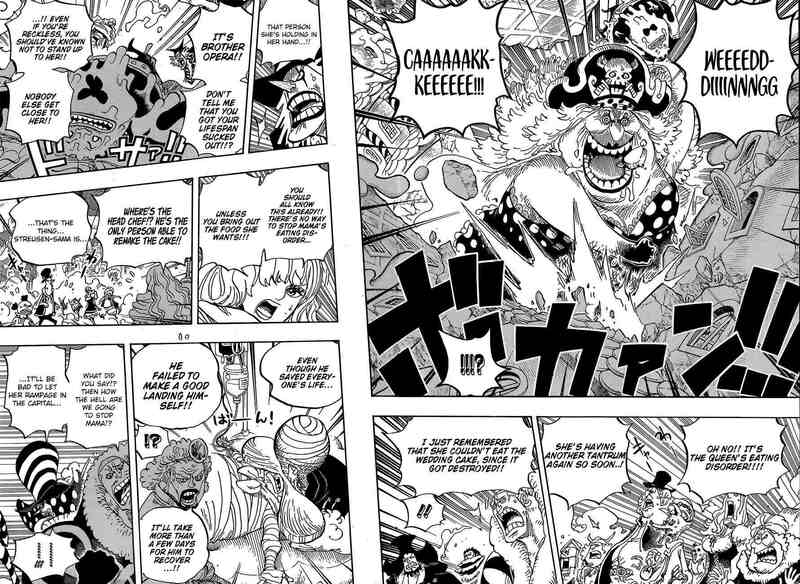 Jinbe uses Fishman Karate: Secret Technique, Vagabond drill, knocking Big Mom off the Sunny. The Strawhat’s cheer the “defeat” of Big Mom, but she is quickly rescued by Zeus. Big Mom decides that she’ll split the ship in half revealing the cake. Nami attempts to temped Zeus with her thunderclouds, but Zeus claims that he will not be tempted again. Zeus attacks what we assume to be Nami, however, it turns out to be Brooke that is completely unaffected due to being bone. Brooke takes aim at Big Mom, whom reminds him that he couldn’t “scratch her,” the last time they fought. He uses Three Verse humming: Soul, splitting Zeus in half, Nami then uses her thunderclouds to trigger an electric charge from Zeus. This results in Zeus shocking Big Mom, giving the Strawhat’s and chance to escape. The official final One Piece chapter of the 2017 was an epic one. Wall to wall battle, seeing the Strawhat’s face off against a Yonko. While, Big Mom is far from defeated she has been challenged by them. I still hold out hope that Nami gains some more power from this arc, maybe the new little Zeus she plans on “enslaving,” will help. Jinbe continues to shine as the newest member of the Strawhat’s and holds Big Mom back. 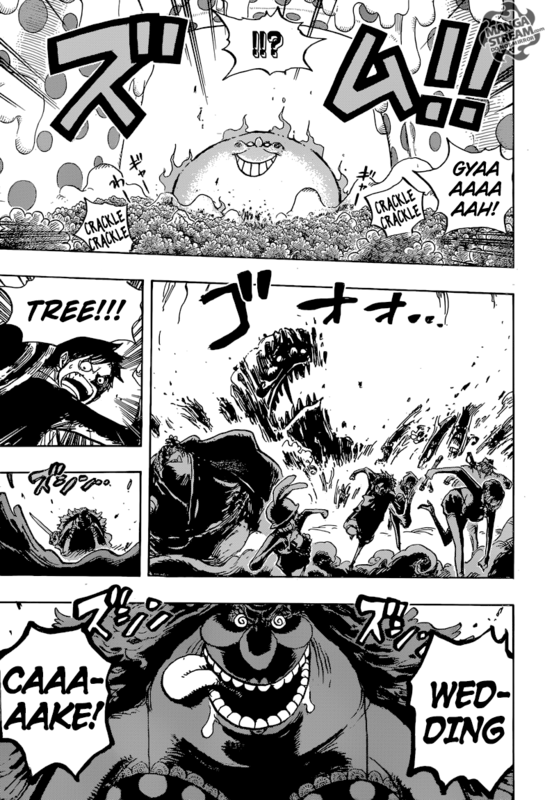 Big Mom continues to give chase, but something tells me that she won catch them before Sanji and the others meet them. Carrot continues her rampage, as Daifuku uses his genie to attack her. However, his genie seems to only manage to help her out as it destory’s many of the ships attempting to hit Carrot. The Strawhat’s are impressed with her new found abilities. 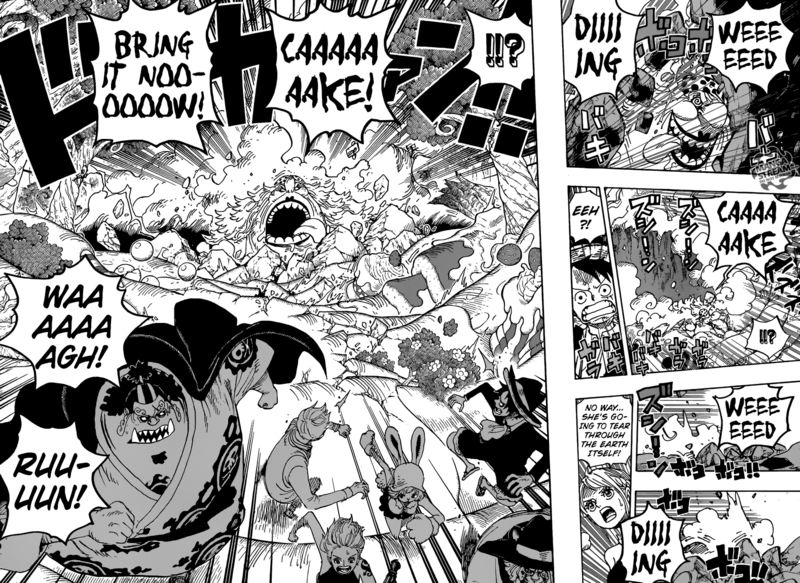 Jinbe informs them that the Sulong form: “Initially, it caused the minks to lose their minds and attack indiscriminately, and they would die within one night from exhaustion.” Brooke helps Carrot, using his speed to run across the ocean’s surface. 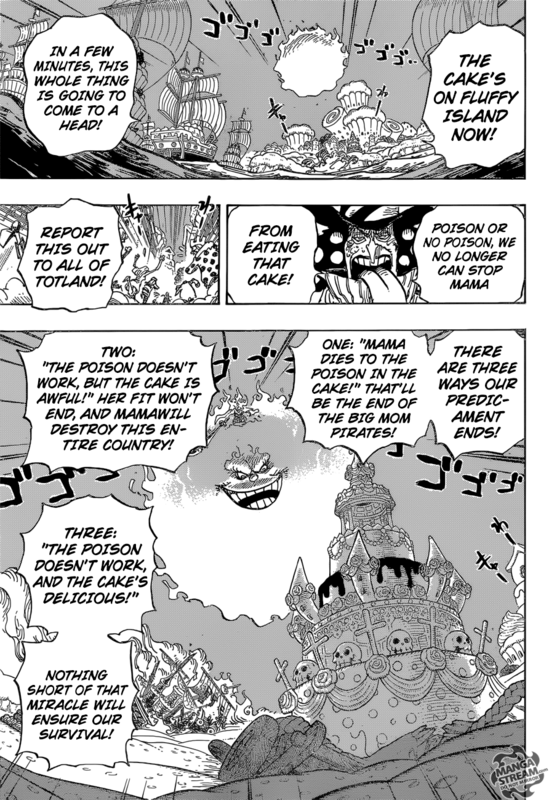 Bege smartly suggests that they should poison the cake, confirming Perospero’s suspicions. However, Sanji is adamantly opposed to doing so. He claims that ” that the taste alone will defeat Big Mom,” Bege doesn’t buy this. Sanji gives him some of the whipped cream from cake, Bege is overwhelmed by the taste and agrees that the cake is to died for. 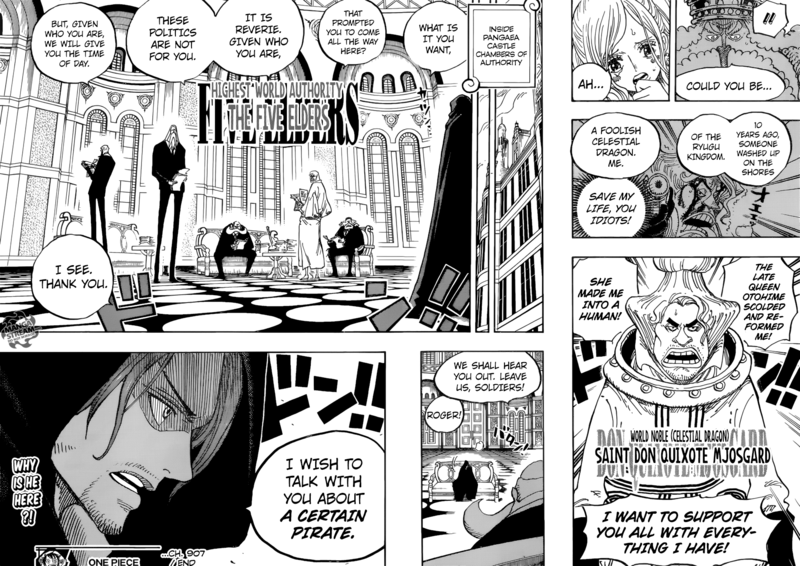 Sanji states that Bege can kill Big Mom after. Diafuku’s ships are destroyed and Carrot continues to attack even though she falling unconscious. Brooke puts the other ships to sleep and rescues Carrot. She reverts her eyes from the moon so she will return to normal. Big Mom prepares to attack the strawhat’s, she calls on Napoleon to turn into it’s sword form. She leaps onto Zeus, with Prometheus in her hair. 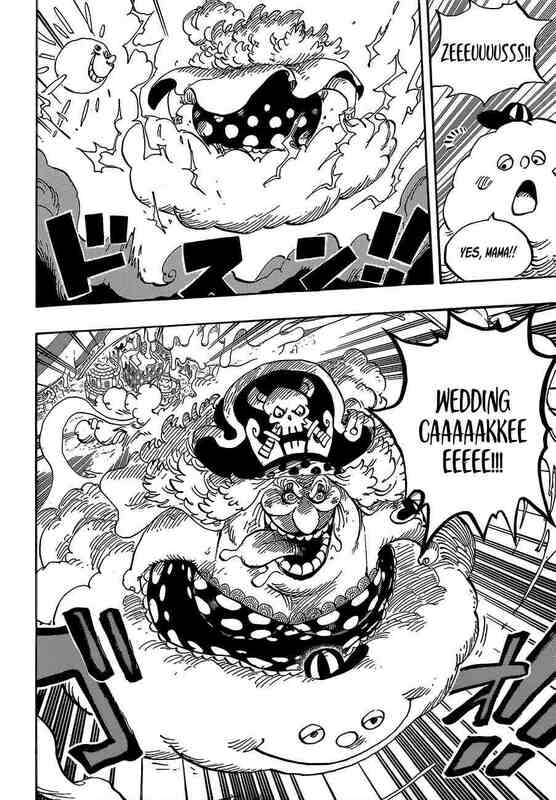 She lands on the Sunny demanding her wedding cake, Jinbe warns the Strawhat’s that they may need to abandon ship. 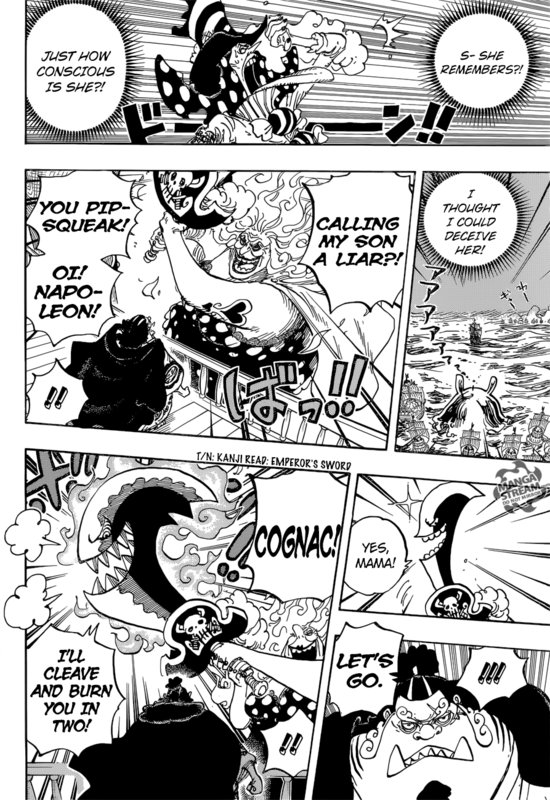 This was a good exciting chapter, that increased the danger that Strawhat’s are in. Big Mom getting skinnier as she becomes more powerful and agile. Big Mom is a beast, I don’t think they can hold out much longer. Oda ends the year with another cliffhanger. 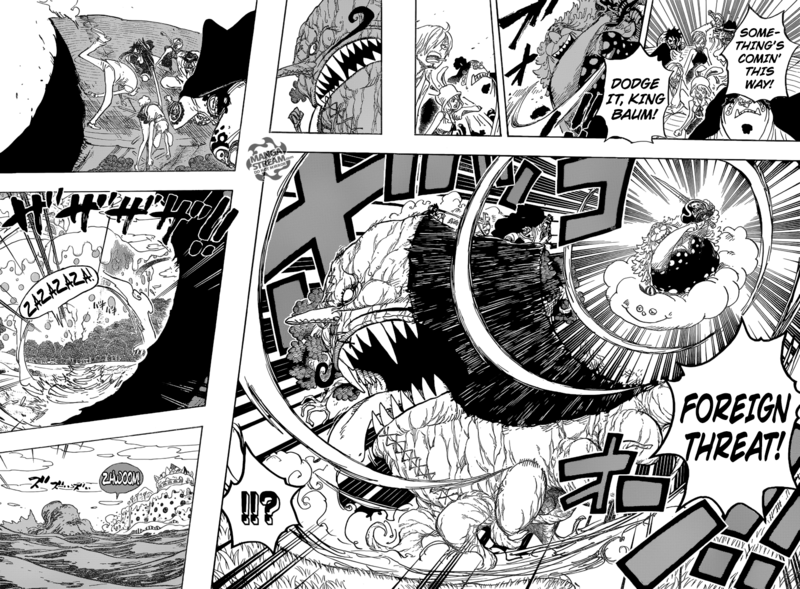 The massive lighting attack created by Nami and Zeus fails, as Big Mom is seeming unaffected. In her wedding cake obsessed trance she continues to walk in a straight line while in the hole, created by the lighting, by eating through the earth. Big Mom resurfaces, forcing the Strawhat’s to flee. 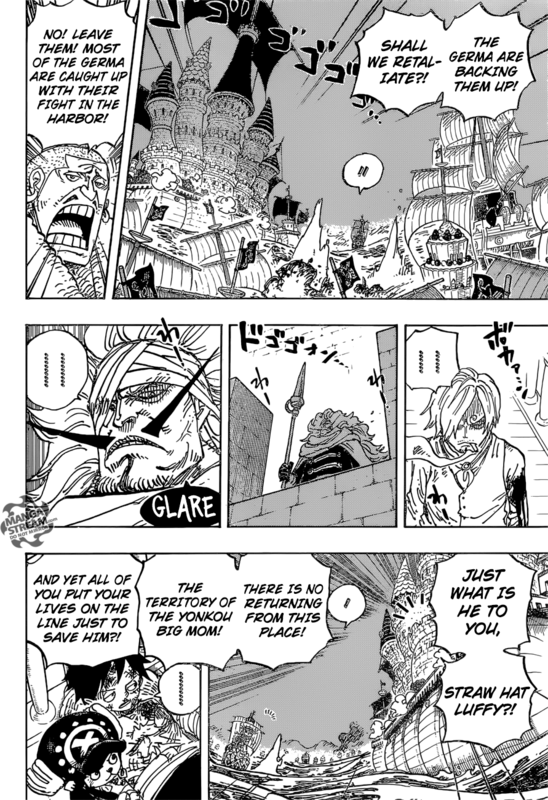 Chiffon and Pudding finally reach the Strawhat’s, Pudding goes through erratic mood swings falling in love with Sanji and then threatening to kill them. Luffy becomes annoyed by her behavior, a wonders if she can be trusted. 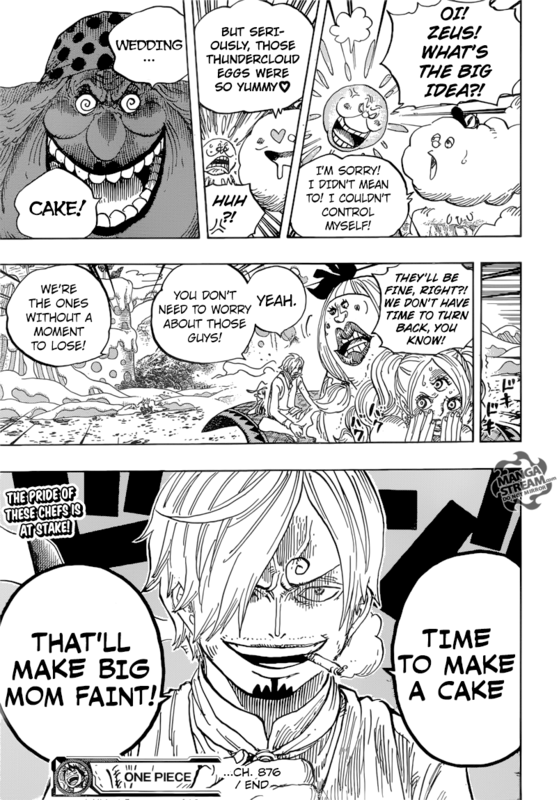 Chiffon takes the lead, informing Sanji that they need to make a cake to stop Big Mom from rampaging. She says “they will make it in Chocolatown on Cacao Island,” the other Strawhat’s are expected to dodge Big Mom while this cake is being made. 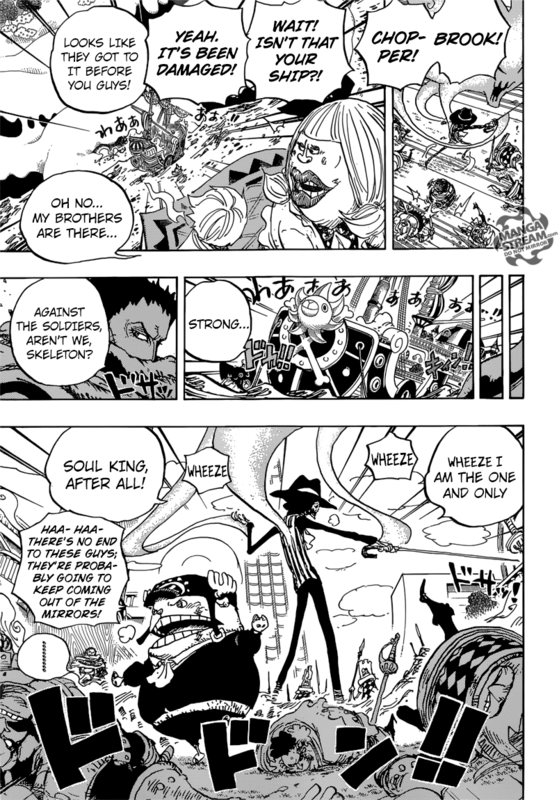 Chopper and Brook face off against many Chess soldiers easily defeating them, however, they keep coming through the mirror in Nami’s room. They decide that the mirror needs to be broken. The Big Mom pirates still believe that the lighting bolt destroyed the Strawhat crew. Brooke refuses to listen to them, as Luffy and the others arrive at the Sunny. Another good chapter, as the Strawhat’s don’t initially escape danger but have a plan that will likely save them. On thing I’m noticing in this arc is the abundance of “disorders,” or uncontrollable behavior. Big Mom, Pudding and Zeus, are susceptible to uncontrollable urges. All these behaviors get in the way of their goals. I predict that Sanji will make a cake so good that either Big Mom will want to capture him permanently or she will let the Strawhat’s go free as thanks. 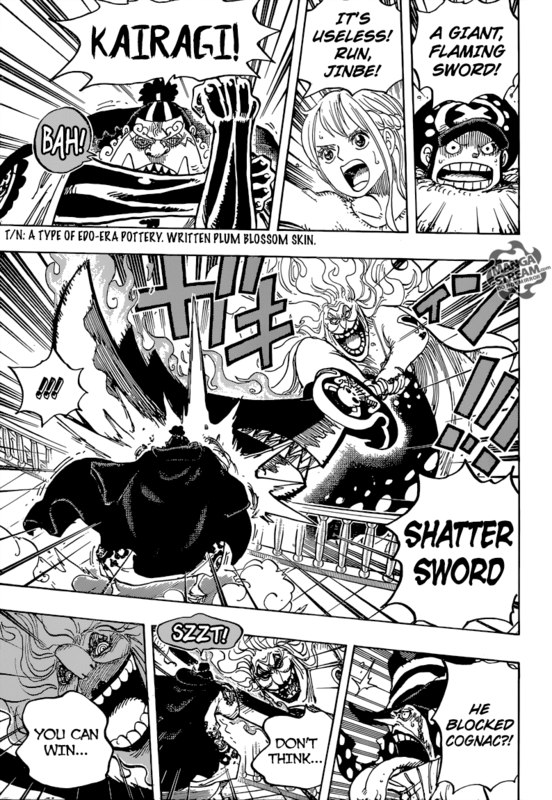 Big Mom charges toward King Baum and the Strawhat’s, she uses her Elbaf Spear: Foreign Threat, blowing a massive hole into King Baum. Luffy remarks that her attack was similar to a giant swing. Big Mom being a yonko means she’s considered one of the four strongest characters in the series, so it’s not surprising that she has such strength. However, it is impressive to watch her power displayed. King Baum is understandingly frightened and begs for forgiveness. 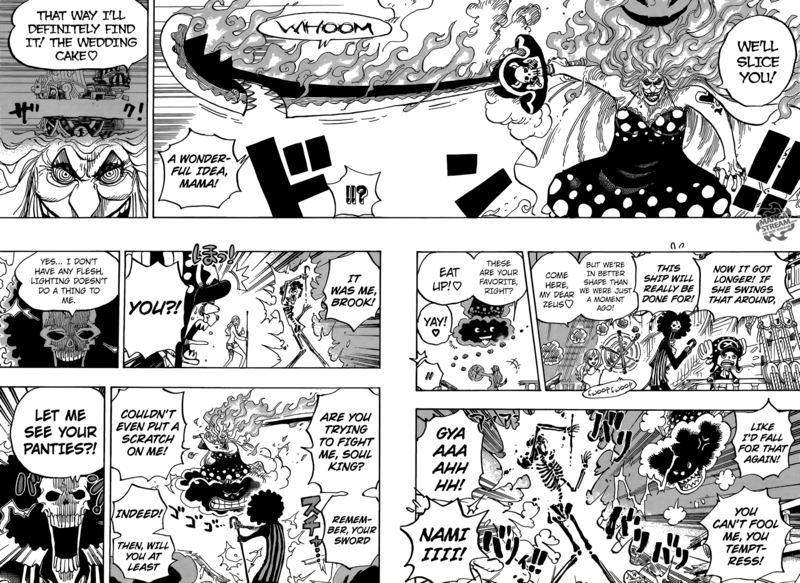 Nami manipulates him by reminding him that about his fiancee, he begins to run as Big Mom prepares to strike again. Nami has a plan to help the strawhat’s, she uses Black Ball and Zeus begins to eat them. Big Mom falls off and misses the Strawhat’s with her attack. King Baum and the Strawhat’s make it to the seducing forest. With the sunny in sight the Strawhat’s hopes are up, Zeus quickly catches up to the Strawhat’s. 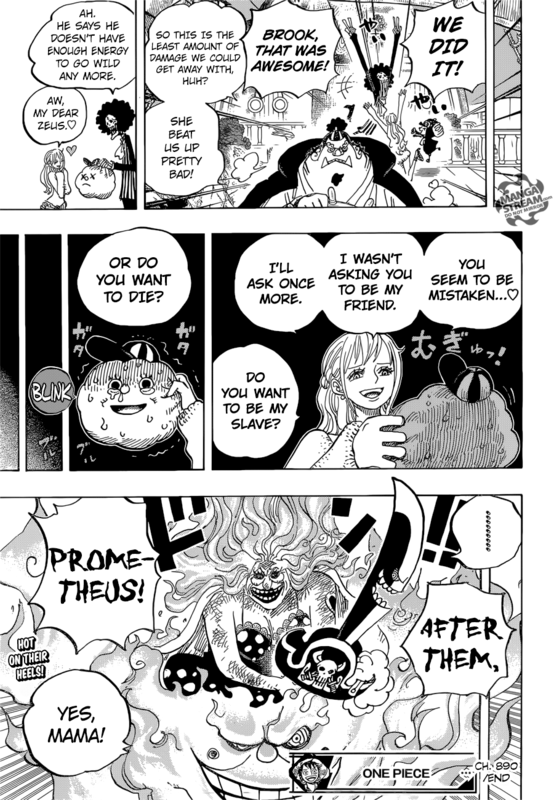 He asks for more of “those little thunderclouds,” Nami asks that if he is willing to “be her servant in exchange.” Zeus seems to have no allegiance to Big Mom and simply asks Nami “what should I do?” She asks him to cover the whole sky. Big Mom tell’s the seducing forest to “stop them,” overriding the authority of King Baum. Prometheus attacks King Baum by growing into a sun sized ball of fire. He obliterates King Baum, as the Strawhat’s flee. Meanwhile, in the mirror world, ten thousand soldiers are waiting to be deployed. The Battleships are also deployed, as are sea slugs underwater, within the sunny waits Katakuri. Bege continues to flee, but Pudding catches up to them. Chiffon refuse to help make the cake for Big Mom, but Pudding is asking for her help saving Sanji and the strawhat’s. Pudding is frustrating as a character, I have no belief that she has reformed herself. However, it would help the Strawhat’s if she did. The deck is stacked against them now and I don’t know what’s going to happen next. The citizens of Sweet City recover from the damage caused by the explosion of the Tamatebako, with the Whole Cake Chateau in ruins, along with the wedding, wedding cake and Vinsmoke assassination plan. They are all uncertain what the cause of the explosion, meanwhile, Katakuri has sent squads to hunt after the Straw Hats, Fire Tank Pirates and the Germa. He asks Brulee to accompany him, as he plans to kill Luffy. Smoothie interrupts them to announce that they need to flee, Big Mom is behind her, as her eating disorder caused her to begin a rampage. Big Mom has a dead Opera in her hand, shocking the Big Mom pirates. All of their lives are now in danger, as Big Mom attacks indiscriminately. 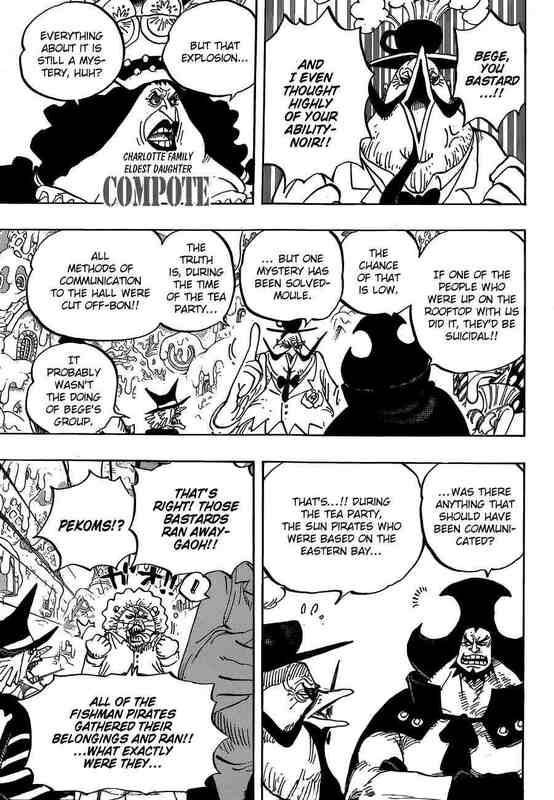 Perospero foolishly lies to her telling her that there’s a second cake and the Strawhat’s stole it. Big Mom warns him that if he’s lying she will kill him. She summons Zeus and rides it towards the Strawhat’s. Katakuri and the others are relieved but know that Perospero only bought the some time. Pudding arrives and reveals a plan to make a chocolate chiffon cake, she seems to back to her evil ways and hopes that Big Mom kills Sanji. The Strawhat’s are rushing to escape and ride a newly sewn together King Baum, they cut through the Seducing Woods. Big Mom quickly catches up to them and she demands the cake back, wielding Napoleon in sword form. Opera’s death isn’t very important nor was it surprising he was already proven to be a traitor. 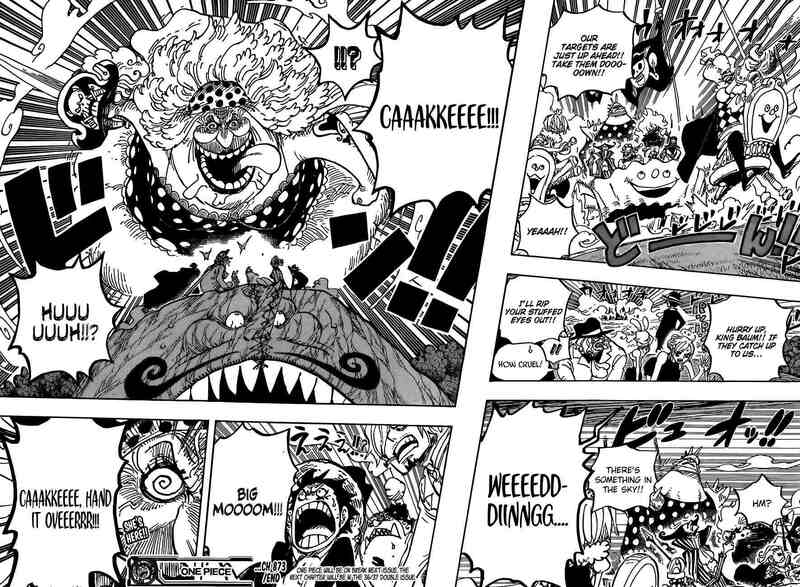 However, the danger Big Mom represents to her own family seems to create a rather tense environment. Normally she’s irrational and selfish, in her current mentality she’s even worst. Perospero basically commits suicide by lying to Big Mom, but manages to save the Big Mom pirates at the expense of the Strawhat’s. I feel that one of the Strawhat’s will sacrifice themselves to buy them time, the best bet will be that it’s Pedro.